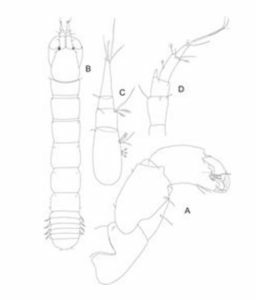 A new species of marine crustacean of the group Tanaidacea has been found off the shore near Plimmerton and Worser Bay (Wellington). 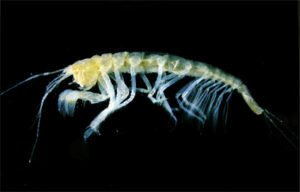 This is a tiny Tanaids a small, shrimp-like creature about 1.5mm long and according to its discoverer, Dr Graham Bird, it is attractive and adds new diversity to the group and a new genus. Dr Bird, a Waikanae taxonomist and a biologist who specializes in the classification of organisms into groups on the basis of their structure and origin and behaviour, auctioned the naming rights for the new species on Trademe. The auction raised $510 for the Paraparaumu Boys College 1st hockey team to attend a September tournament in Auckland. The winner of the auction, on Trademe, was Sebastian Parri of Christchurch who has chosen to name the new Plimmerton shrimp ‘Sebparri’. According to Dr Bird the example D above is the closest to the newly named Sebparri. So if you see one or two floating past you when swimming off Plimmerton this summer welcome it to the neighbourhood. Story by Allan Dodson. References – Dominion Post 18 & 21 August 2012. Bottom – According to Dr Bird the example D above is the closest to the newly named Sebparri. So if you see one or two floating past you when swimming off Plimmerton this summer welcome it to the neighbourhood.